Modular seal links leading design WA-GKD with strong grip force seating features. Engineered for sealing larger pipe penetrations through concrete walls. 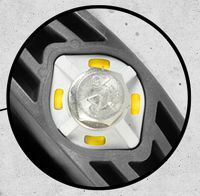 Bolt head indicators display optimum tightness windows when seating torque is reached. New - Installer feedback windows. Torque wrench not required. Long life corrosion resistant 316L stainless nuts and bolts with EDPM or NBR rubber elastomer. 72 psi pressing water protection. Corrosion resistant stainless 316L hardware is the standard on all links. Better watertight solutions in Water treatment plants (WWTP)' in sewage storage tunnels (CSST), under ground tunnels, foundation structures. No leaks. Pipe seals for American and International diameter pipes. Sealing for steel pipes, - Plastic, PVC, Ductile Iron pipes. Nuts are molded into pressure plate, no lost parts at the job site. Optimum tightness confirmation at a glance. Modular seal systems when pipe through concrete walls are installed. Optimized compression bolts - nuts are embedded in the pressure plates. Tight up to 72 psi (5 bar) ( Lloyd register). "Yellow window indicators" - "Safe" - "Watertight"
Seal elastomers may be EDPM or NBR, bolting hardware is 316L stainless steel. 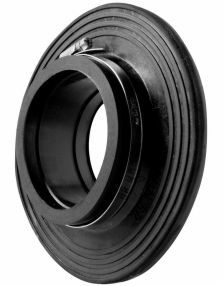 Westatlantic WA-GP modular seals are the latest and leading industry seals. We provide direct support and will be glad to assist you in all questions on the sealing of conduit, cables and pipes through concrete walls or steel walls. We will be happy to offer seal selection and wall opening guidance for any project. Modular seals with oil and gas NBR rubber and 316L stainless steel nuts and bolts. 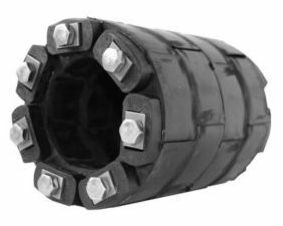 NBR rubber elastomers provide endurance, isolation and safety for oil and gas steel pipes. 72 psi seals with corrosion protection 316L bolts and nuts. Modular seals with visual confirmation of tightness. Large-diameter pipe sealing specialized for refinery and oil and gas handling facilities, adding safety and long life. Visible torque indicators - insure security of the installation. Integrated inspection window - accurate installation confirmation. No waiting time between tightening. No time consuming repeated retightening. Pipe through wall component systems, consist of integrated assembly of wall sleeves - pipe sleeves - modular seals. 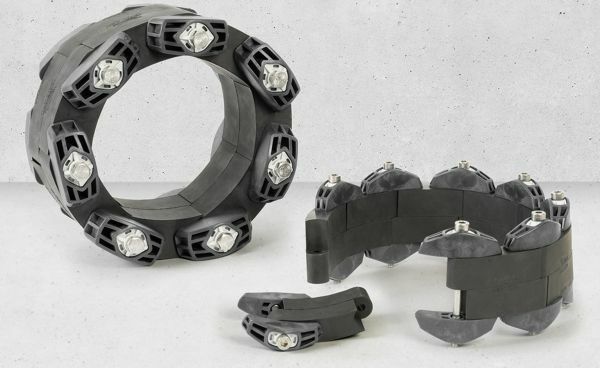 Modular Seal Link belt systems and WA-GP disk seals for sealing pipe through concrete walls. Waterworks EDPM seals, Oil and Gas NBR Seals, High temperature - Fire resistant to 440 F.
Pipe penetrations through Manholes, Wet Wells, Lift Stations, Valve Chambers, Concrete box Culverts and Bulkheads. For Water - Wastewater Treatment Plants and other connection systems, when water or gas tight seals are required. Sealing for SDR Pipe, Ductile iron, Concrete, PVC, and Sewer pipes low or high pressure sealing up to 72 psi of pressing water. For maximum corrosion resistance in treatment plants, EDPM elastomer and stainless steel bolting is standard seal material. Seal elastomers: EDPM, for water applications and oil and gas resistant NBR elastomer for petroleum applications. Silicone elastomer Fire Resistant High temperature 440 F.
Viton element pipe seal plugs are used in "split, Viton compression seal models", where applications require a Viton element for certain liquids. Provides a 36 psi seal, 80 foot head pipe seal system. Seal integrity when higher head pressure is present. Corrosion Resistance Stainless steel or galvanized bolting. When annular openings are larger than the expanded thickness of a single link belt, two layer assemblies are provided. Modular seal link models WA-DL : are 72 psi - 5 bar, tight up to 160 foot water head. DL high pressure modular links element seals are available for conditions where pressing water is greater than 36 psi. Seal more than one pipe through the same core. Watertight up to 36 psi of pressing water. Maintain leak integrity up to a 80 foot. of water head." Watertight up to 160 foot water head using D-LPS Models, see below. For pricing Contact Westatlantic Tech Corp.., USA and Canada. 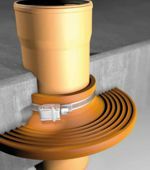 Compression Disk- pipe seals WA-GP models for pipe through concrete walls, with a 2-1/4 inch thick profile. Compression disk seals for through wall conduit and pipes. 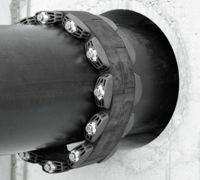 Including a split versions, for pipes that are already in place. Compression disk seal sizing is determined based on the number of pipes or conduit through the same opening. 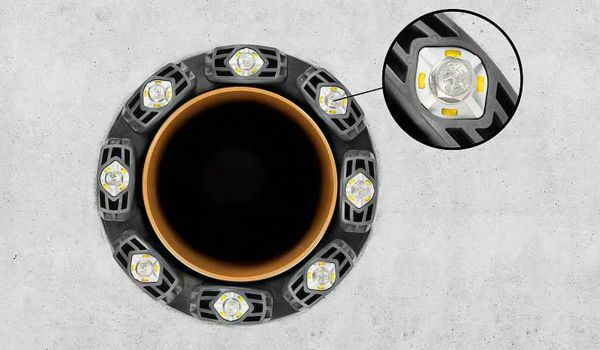 Hole size is the determining factor for the number of pipes that can be sealed using multiple disk compression seals. Compression disk pipe sealing is used for multiple pipes through the same opening, large annular spaces, holes or core holes too small for other types of pipe seals, when higher pressure seals are required. 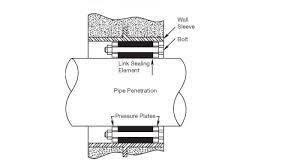 Eccentric compression disk seals are used for pipes that are off center through a pipe sleeve or drill core. 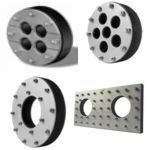 PUDDLE FLANGES: Sealing puddle flange collars for cast in pipes through walls, floors, pool walls, Ice rink concrete slabs. Wall sleeves WA - ZVR permanently bonds to the concrete and becomes an integrated part of the wall structure. Engineered structurally from tough inherently stable plastic inner layer, the exterior has a special fused cementation coating for concrete-bounding. Eliminating the need for a puddle flange. WA-ZVR sleeves maintain complete pipe overtly during concrete placement. A perfectly symmetrical entry point is formed for pipes and conduit passing through the structure. Ideal for block wall retrofitting or new block walls. 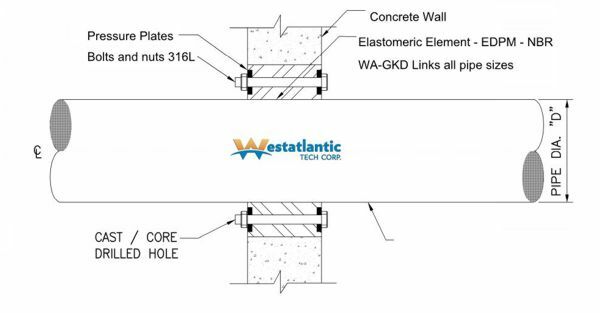 Cement bonding pipe sleeves are available from Westatlantic Tech Corp..
Wall sleeves WA. 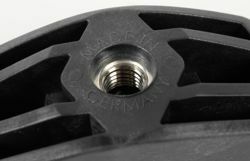 ZVR are watertight at pressures up to 72 psi (5 bar) – used in conjunction with modular seals or disk compression seals and press seals, they produce a completely watertight penetration for pipes, conduit or cables.